StoneCreek Lodge is Missoula's Finest Hotel. We are the Closest Missoula Hotel to the Missoula International Airport, offering Exceptional Missoula hotel Service & Seasonal Extended Stay rates in Missoula. Our Hotel located in Missoula, MT features Truly Spacious Rooms & Suites all with full or efficiency kitchens, LCD TV's, Luxurious Pillow-Top Beds & Work Desks. Wake up to our daily Complimentary Full Hot Breakfast Buffet each morning. Additionally, our hotel in Missoula offers a 24/7 Business Center, On-Site 24/7 Convenience Store, Fitness Center, On-Site Dining Room, Guest Laundry & Gift Store. 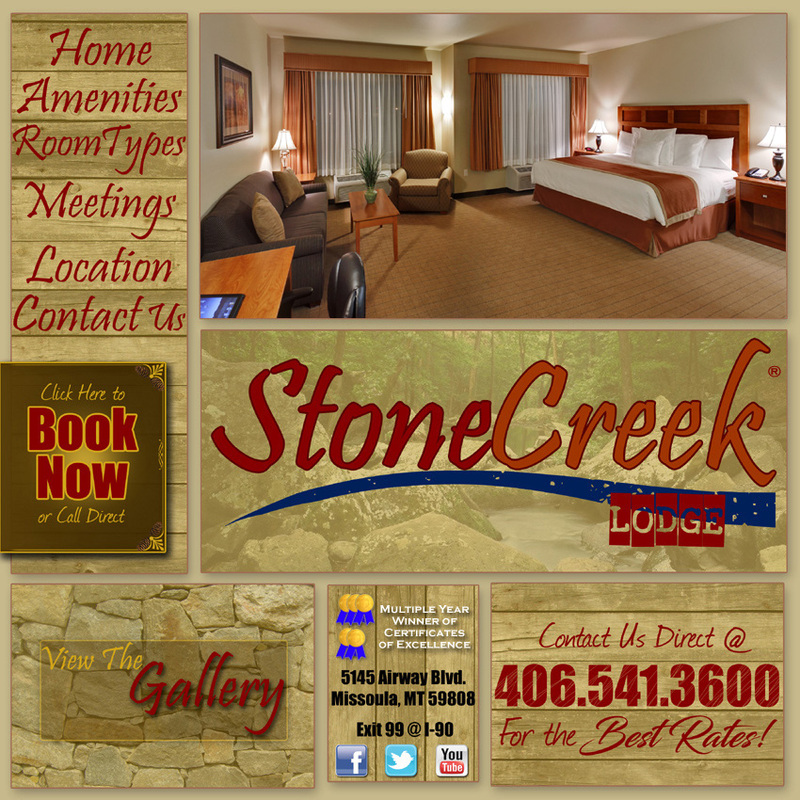 StoneCreek Lodge features a modern Indoor Mineral Swimming Pool & Spa. Stay connected with Free Hi-Speed WiFi & internet access offered thru out the Hotel. Our Banquet Facilities include a State-of-the-Art Executive Boardroom Suite as well as two Spacious Meeting Rooms. In addition, we offer Remarkable Luxury Executive Suites each with over 1,000 square feet. Conveniently Located away from the hassle of traffic congestion yet Just Minutes from downtown & Missoula's shopping district on Reserve St. Plenty of Free Parking for RVs, buses, trailers and trucks in our huge open parking lot! StoneCreek Lodge will exceed all of your expectations for both leisure and corporate travelers looking for a hotel in Missoula. StoneCreek Lodge is Missoula's Finest Hotel. Closest Missoula Hotel to the Missoula International Airport, offering exceptional Missoula hotel service and Seasonal Extended Stay rates in Missoula. Missoula Hotel, Missoula Hotels, Hotel Missoula, Extended Stay Missoula Hotel, Hotels Missoula, StoneCreek Lodge, Missoula's Finest Hotel, Missoula Motel, Extended Stay Missoula, Missoula International Airport Hotel, New Missoula Hotel, Suites Missoula, Leader in Missoula Hotels, Airport Hotel, Stay and Fly Missoula, Airport Stay and Fly, Indoor Swimming Pool, Indoor Mineral Pool, Meeting Rooms, Meeting Space, Convention Center, Convention Facility, Boardroom, Fitness Center, Business Center, On-Site Convenience Store, Best Choice in Missoula Hotels, Hotel is Near Downtown Missoula, Bigsky Brewery and the University of Montana.